Three men from West Texas walk into a Washington, D. C. restaurant Monday morning, before going home after attending the Trump inauguration. They are waited on by a young African-American woman who had been in the Women’s March protesting the Trump presidency… This doesn’t sound like the beginning of a heart-warming ‘feel-good’ story, but that is what it turned out to be, as reported in this article by Colby Itkowitz in the Washington Post, January 25, 2017. When Jason White walked into Busboys and Poets Monday morning, a Washington restaurant that promotes social justice, he looked around and told his friend he might want to remove his red “Make America Great Again” cap. The three white Texan men knew they stuck out in a place where African-American art and images cover the walls. And White said he could sense when his waitress greeted them that she knew they did too. But Rosalynd Harris had arrived at work that morning still high off the energy from the Women’s March. Her customers Saturday had been abuzz with an optimism that was contagious. So she was especially cheery when she greeted White and his two friends. They chatted warmly. They told her they were from West Texas. White is a dentist and he complimented her on her smile. They were jovial and fun. Harris admits that White was right. She did prejudge them, by instantly assuming they were in town for President Trump’s inauguration by appearance alone, even though by that point the signature red baseball cap at been tucked away. 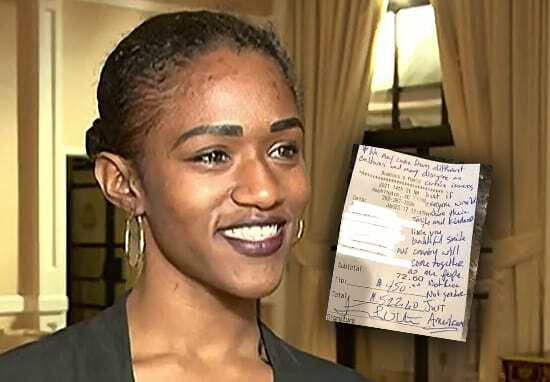 When the men finished their meals, White decided to leave Harris, a 25-year-old African American woman, a personal message on the receipt. 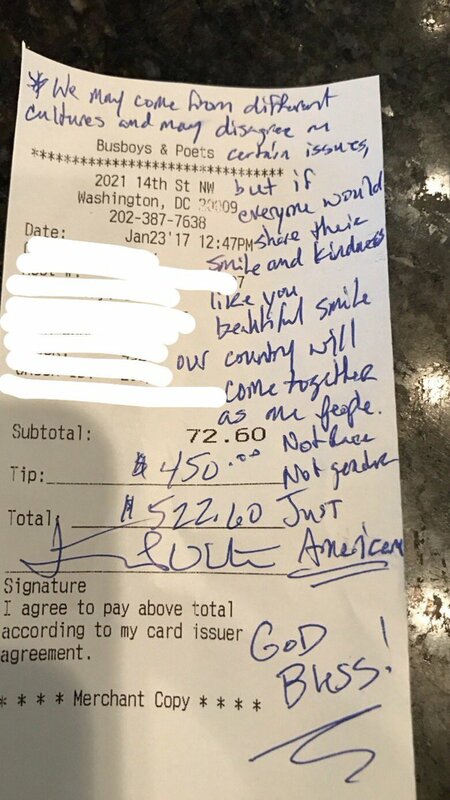 Then, after he wrote it, he left a $450 tip on their $72.60 bill, which is a nearly 625 percent tip. The $450 was a nod to Trump, the 45th president, White said in an interview, as a symbolic gesture that he hoped everyone could move forward together. White, 37, didn’t even tell his friends what he’d done. But he’d felt so moved by all he’d seen in Washington that weekend. A Trump supporter from the very beginning, he said that he believed Trump would infuse the government with new leadership and a new mindset. A devout Christian, he doesn’t agree with all of Trump’s rhetoric, but said he believes that the president sometimes speaks without thinking first. Being in Washington for Trump’s inauguration and then witnessing the Women’s March the next day, White felt both events represented the very foundation of what it means to be an American. On Saturday he and his friends went to Arlington Cemetery and he said he was so moved watching the guard at the Tomb of the Unknown Soldier, thinking about how they perform the same 21-step tradition regardless of politics or who the president is. The men were gone before Harris saw the receipt. She read White’s words before she saw the tip, and the words alone were enough to overwhelm her. The windfall also came at a time when Harris could really use it, she said. A professional dancer, she started waitressing about a year-and-a-half ago to make extra money to pay her bills. She needs to move to a new apartment soon and has worried about how she’ll have enough cash to pay any upfront costs. She scheduled herself to work extra shifts to ensure she had enough, and the extra $450 is “a huge weight off my shoulders,” she said. But she said the men left her with so much more. Their words were a reminder not to make assumptions. And that so many Americans want unity, regardless of their politics, and to not be afraid to connect with someone as human beings, she said. For White, he said he wanted to show her that they probably have more in common than it would appear. “As I sat there I thought about the entire weekend and I thought I don’t know her, she doesn’t know me, but if most Americans have a preconceived perception about people then we’re never going to get better,” he said. Galatians 5:22-23a — The fruit of the Spirit is love, joy, peace, forbearance, kindness, goodness, faithfulness, gentleness and self-control. Colossians 3:12-15 — Therefore, as God’s chosen people, holy and dearly loved, clothe yourselves with compassion, kindness, humility, gentleness and patience. Bear with each other and forgive one another if any of you has a grievance against someone. Forgive as the Lord forgave you. And over all these virtues put on love, which binds them all together in perfect unity. Let the peace of Christ rule in your hearts, since as members of one body you were called to peace. And be thankful. Ephesians 4:1a-6 — I urge you to live a life worthy of the calling you have received. Be completely humble and gentle; be patient, bearing with one another in love. Make every effort to keep the unity of the Spirit through the bond of peace. There is one body and one Spirit, just as you were called to one hope when you were called; one Lord, one faith, one baptism; one God and Father of all, who is over all and through all and in all. Teach me to be kind, O Lord. Help me to remember that everyone I meet is fighting a hard battle. Amen. Consider that perhaps the jerk who cut you off in traffic last night is a single mother who worked nine hours that day, that she was rushing home to cook dinner and help with homework, and then do the laundry, and then try to spend a few precious moments with her children. And perhaps the pierced, tattooed, seemingly disinterested young man who takes forever at the checkout stand, is a worried 19-year-old college student, who is balancing his apprehension over final exams with his fear of not getting his student loans for next semester. And perhaps the scary looking bum, begging for money in the same spot every day (who really ought to get a job!) is a slave to addictions that we can only imagine in our worst nightmares. And perhaps the old couple walking annoyingly slow through the store aisles and blocking our shopping progress are savoring this moment, knowing that, based on the biopsy report she got back last week, this will be the last year that they can go shopping together. This man beside us also has a hard fight with an unfavoring world, with strong temptations, with doubts and fears, with wounds of the past which have skinned over, but which smart when they are touched. It is a fact, however surprising. And when this occurs to us we are moved to deal kindly with him, to bid him be of good cheer, to let him understand that we are also fighting a battle; we are bound not to irritate him, nor press hardly upon him nor help his lower self. Ephesians 4:31-32 — Get rid of all bitterness, rage and anger, brawling and slander, along with every form of malice. Be kind and compassionate to one another, forgiving each other, just as in Christ God forgave you. Colossians 3:12 — Therefore, as God’s chosen people, holy and dearly loved, clothe yourselves with compassion, kindness, humility, gentleness and patience. Galatians 5:21-22 — But the fruit of the Spirit is love, joy, peace, forbearance, kindness, goodness, faithfulness, gentleness and self-control. Against such things there is no law.